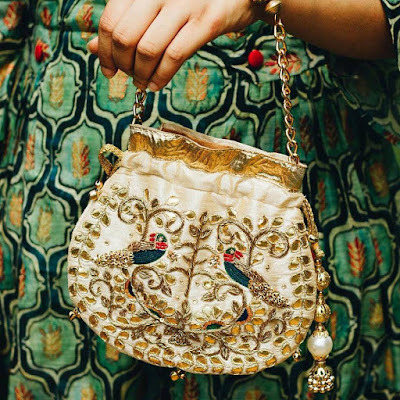 Ri(t)ch Styles : Indian Fashion, Beauty, Lifestyle and Mommyhood Blog: Ethnic bags that are must haves in your wedding wear wardrobe! 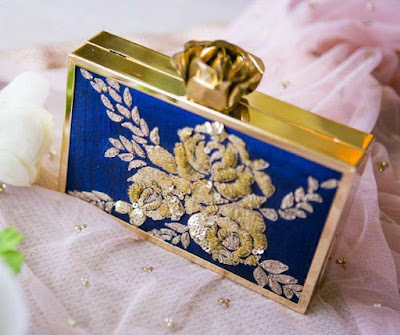 Ethnic bags that are must haves in your wedding wear wardrobe! 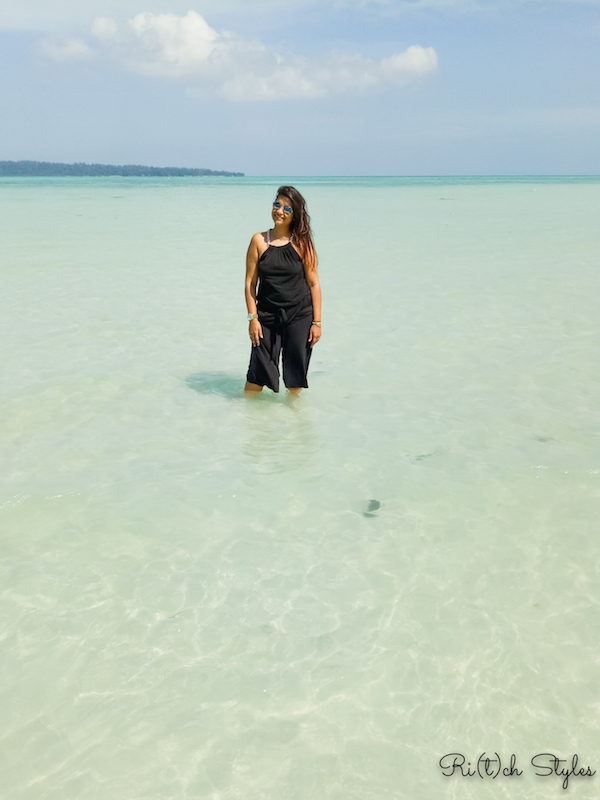 The whole country was fixated on Sonam Kapoor's wedding and I was no different. From the painstakingly detailed ghagras to the natural makeup look to the spectacular jhumkas - everything that the stylish bride and her equally discerning bridal entourage and guests wore, was enthused about in the media. 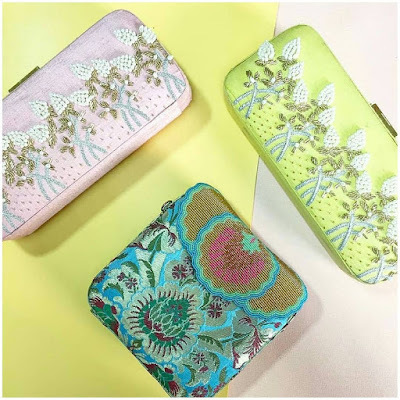 But there were two accessories in particular that caught my eye throughout the series of ceremonies and those were pretty potli bags and intricately ornate clutches! I've been in love with these petite arm candies for as long as I can remember and don't recall attending a wedding or a traditional function without these classy accompaniments. I must say, Potlis bags have re-emerged as a tres chic accessory to perfectly round off any traditional ensemble. About a few months ago, I bought this ultra-gorgeous designer bag online which I just can't seem to have enough of. It has a detailed floral artwork which is executed using beautiful sequins and is topped off by a vintage rose clasp, in short. It's equal parts classy and classic and can be teamed with both traditional and contemporary outfit. Also known as Minaudiere, a sequin box clutch is a perennial favourite that can be manoeuvred all year round. No accessory can beat the allure and elegance of a potli bag. A potli adorned with kitschy and quirky elements will elevate your look in a heartbeat. I’m drawn towards those that are speckled with eye-catching pops of neon hues like pink, peacock green, tangerine, etc. I’m also partial to potlis that showcase dainty needlework like zardosi, aari, gaara, et al as they also reinforce my belief of supporting domestic Indian textile crafts. 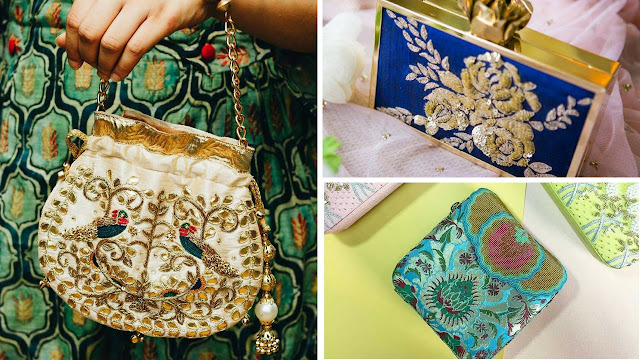 With the wedding season in full swing, you are possibly looking for resources that will help you be on fleek and the good news is - there are many exciting brands that sell beautiful potli bags online in India! A smaller and a cuter version of the clutch, a pouchette clutch is another versatile piece that you must possess in your accessory arsenal. As a mommy and stuff hoarder (a term bestowed upon me by my family), I’m known for carrying far too many things than I should be. The result - bulgy, pokey handbag that is way too difficult to carry! A pouchette clutch means that I have got my priorities straight. I have to carry only that which is absolutely essential - my lip tint, kajal, and car keys - that’s it! With so many varieties, styles, and colours - you very well can see that you can choose ethnic bags that can be paired seamlessly with your outfit whether traditional-with-a-twist or boho. So Happy Shopping ladies. Make sure you get these ethnic bags that are must have in your wedding wear wardrobe!